Joint use is, by nature, a bit of a fractured business: it has two distinct sides to its story. On one hand, you have physical assets in the field— utility poles and conduit that require physical attention to install and maintain. On the other hand, you have a constant stream of information—virtual intelligence from contracts and agreements, to raw data on pole logistics and health, as well as databases full of attachment records, invoices, billing information and contracts. The thing is, both of these very different sides of the utility asset management coin are crucial to keeping your business running smoothly and keeping power and information flowing efficiently to your customers. If you are feeling pulled in many directions at once managing it all, you are not alone. It is no secret that joint use departments are often taxed to the limit. Resource contention is the two-word phrase of the day (or year, more likely). Managing both in-the-field and in-the-back-office work can be an overwhelming task. Fortunately, help is available in the form of a magical combination of two other words: managed services. Let us use a specific but anonymous case to illustrate how one smart service provider can leverage unique combinations of in-the-field experience and back-office expertise to solve the joint use puzzle. A large communications company was recently asked to move thousands of pieces of equipment as part of a road-widening project. Time ran short and the company could not keep up with the requests, eventually finding itself party to thousands of instances of double wood as their assets held up removal of unused poles. The pole owner reserved the right to transfer ownership of the disused poles to the communications company, but obviously that was not the outcome the client wanted. So Alden was asked to help. 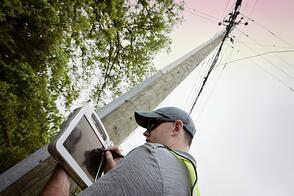 In the field, technicians were deployed to visually survey over 20k poles. The goal: to verify the transfers that had been recorded had actually been performed, and if any attachments were still hanging on the old poles. In the back office, Alden took over and used our Notify™ software system to manage the transfer process, putting order and priority to the transfer requests and opening lines of communication between the client and pole owner. Back in the field, technicians were deployed to complete the transfers that were determined to be incomplete during the initial field visit. With no confusion about what work still needed to be done to which poles, the remainder of transfers could be completed swiftly and efficiently, and the communications company made great progress cleaning up their double wood dilemma. The moral of the story is this: When back-office process shakes hands with in-the-field activity, good things happen. Joint use is all about partnership and managed services represents the best kind of collaboration—the kind that eliminates backlogs and makes resource contention in joint use a thing of the past by putting together the pieces—in the field and in the back office.